Armored Trooper Votoms is an action game by Takara and based on a popular Japanese animation series aired for the first time in 1983. 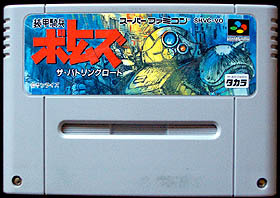 Players take controls of heavy armed Votom mechas and fulfill missions assigned to them, all of them taking place in 3D environments heavily relying on the Super Famicom's mode-7. But before springing into action, the player must fist undergo a short training program, and learn how to pilot a standard ATM-09-ST (codenamed The Scope Dog) equipped with a weak arm punch as only weapon. Passed this test, the first real mission begins. Now an heavy machine gun is available for combat and things get a big more serious with real enemies capable of firing deadly vulcan guns as well as missiles. Later stages get harder, from simple area mode where the player can freely move around a closed arena, to complex stages where he has to follow a given path and confront heavily armed bosses. As expected, more weapons are available later in the game, such as the poweful shoulder missile launcher. Sōkō Kihei Votoms (aka Armored Trooper Votoms) was a popular japanese TV series first aired in 1983 and created by Ryosuke Takahashi (original creator and director), Norio Shioyama (Character Designer) and Kunio Okawara (Mecha Designer). Far in the Astragius Galaxy, the Gilgamesh Confederation and the Balaran Union are at war and a peace agreement is being signed by the two parties. The series tells the story of the elite warrior and trooper pilot Kiriko (aka Shirico Curvie) who ends up betrayed by his own side. His long journey will get him to unveil a conspiracy that threatens galactic peace. The series was immensely popular in Japan and video games obviously followed. Here is a non exhaustive list : Sōkō Kihei Votoms Dead Ash (Sharp X68000), Sōkō Kihei Votoms Black Unicorn (Nec PC8801), Sōkō Kihei Votoms The Real battle (Nec PC9801), Sōkō Kihei Votoms Gaiden: Blue Knight Berserga Story (Playstation, 1997), Sōkō Kihei Votoms: Woodo Kummen (Playstation, 1998), Sōkō Kihei Votoms: Koutetsu no Gunzei (Playstation, 1999). 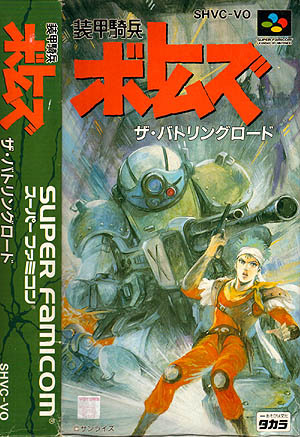 Sōkō Kihei Votoms (Playstation 2, 2007) Sōkō Kihei Votoms is one of the fifteen Super Famicom games to use the DSP-1 chip (Digital Signal Processor). This math co-processor (included with the game) was used to boost-up the existing Mode 7 and enhance sprite scaling and rotations. Despite adding a cost to the original cartridge, these co-processors were also (somewhat) an easy way to prevent software piracy. Other popular Super Famicom games, such as Super Mario Kart, Pilot Wings and Super Air Diver, also included an on board DSP chip. 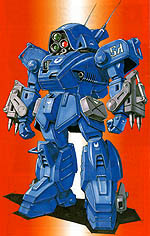 Sōkō Kihei Votoms was one of the fifteen Super Famicom games to use the DSP-1 chip (Digital Signal Processor). This math co-processor (included with the game) was used to boost-up the existing Mode 7 and enhance sprite scaling and rotations. Despite adding a cost to the original cartridge, these co-processors were also (somewhat) an easy way to prevent software piracy. Other popular Super Famicom games, such as Super Mario Kart, Pilot Wings and Super Air Diver, also included such built-in DSP chip. Armored Trooper Votoms has not aged well in the visual department. Controls are a bit awkward, and your mecha can be very hard to control and handle. Unlike you, enemies are able to maneuver and stear around really fast. In truth, each arena is closed off (except for the 'road' stages) and you often end up bouncing around erratically without much control. However, enemies' ammo is also limited which is an incredible feature - if you are patient enough, some of them will eventually run out of missiles so you can engage them in close combat. All in all, Armored Trooper Votoms is somehow interesting, but it is particularly badly executed and the gameplay is far too clunky to be enjoyable.